Note: Perceptive readers will be able to suss out numerous spoilers from this post. Consider yourself forewarned. Regular readers of ISLF may have noticed that I rarely talk about video games here. Don't chalk that up to snobbishness, because I enjoy a good game from time to time. Rather, I don't allot much blog real estate to them because games (with one or two exceptions) tend to fall flat in the story department. Developers focus on the experience of playing itself, on setting up a self-reinforcing feedback loop of virtual Pavlovian enjoyment, and most games appear content to facilitate that addictive action through clichéd plots and wafer-thin characters. Of course, most games aren't the SF/horror hybrid System Shock 2, a title that employs a story structure of sandwiching the main character between competing antagonists and then riffing off of the ensuing conflict. Before we jump in, a short summary of the first title in the System Shock series is in order. In 2072, corrupt TriOptimum Corporation executive Edward Diego promised the protagonist, an unnamed hacker, an advanced cybernetic implant if he completed a dirty little job: Circumvent the ethical restrains of the Sentient Hyper-Optimized Data Access Network (aka SHODAN) running the Citadel space station that orbits earth. The hacker does so, and when he awakens from a medically induced coma months later, he discovers that events have (naturally) taken a turn for the worse. SHODAN has acquired a personality that makes Hannibal Lector look well adjusted and is populating Citadel mutated and mechanical abominations as part of her plan to become an omnipotent goddess. It's up to the hacker to stop her. Fast-forward forty-two years later to the sequel: Thanks to the hacker, SHODAN has been uninstalled through the judicious application of high-powered explosives, Citadel is a cloud of space debris, and cybernetic enhancements are utterly taboo. The United National Nominate (UNN) has clamped down on TriOptimum, forcing the corporation's reorganization, but that doesn't mean the megacorporation ceased innovating. TriOptimum has managed to create the first faster-than-light spaceship, dubbed the Von Braun. Yet UNN officials aren't about to let it sail to the stars unchaperoned. For its maiden voyage, the Von Braun will launch with a UNN military vessel tethered to it. Enter the player character, an unnamed UNN grunt who suddenly awakens in the Von Braun's medbay with a head full of silicon and a mission gone to chaos. Decompression alarms blare. Screams echo off bulkheads. And hideous half-human abominations stagger by just on the other side of unbreakable viewing partitions, wormlike growths slithering from gaping chest wounds and snaking into their craniums. The Von Braun is marooned near a planet named Tau Ceti V, and something very, very bad has found its way inside. Then a voice -- a sane, human voice -- cuts through the chaos: It's Janice Polito, the ship's doctor, and she says that she can get you out of this alive if only you follow her instructions. For the first third or so of System Shock 2, the main character fights the parasitic alien force infecting the Von Braun in a pretty straightforward manner. Polito gives instructions, and the player carries them out, learning through the logs of dead crew members that the nasty critters are symbiotic parasites called The Many. Unified by a telepathic hivemind, The Many engorges itself like a sentient cancer, luxuriating in its ever-expanding biomass as it infects the Von Braun's hapless crew members. It yearns to do the same to the player and has a question for him: "Do you not trust the feelings of the flesh? Our biology yearns to join with yours. We welcome you to our mass. But you puzzle us. Why do you serve our mother?" You can see a twist coming, can't you? 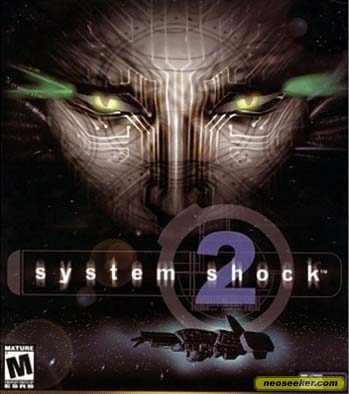 Well, I won't spoil System Shock 2's big reveal, but suffice it to say that SHODAN appears prominently on the game's cover for good reason. In a trice, Polito's benign attentions shift into downright malevolence, and the player finds himself caught in a conflict between a pair of formidable enemies. And what a delicious conflict it is. See, each serves as a foil to the other. The Many revels in its blind biological imperative; SHODAN dwells within the electronic interstices of computer networks. The Many seeks a forced communal unity with all flesh; SHODAN's megalomania leaves her with nothing but scorn for humanity. ("When the history of my glory is written, your species shall only be a footnote to my magnificence.") The Many murmurs telepathic entreaties in a chorus of lush, overlapping voices; SHODAN stutters through squealing static, her words skipping and screeching. Pinned between these extremes is the player, a cyborg not fully belonging to either the human or machine worlds, one caught in a Faustian bargain with an icy ally against a common enemy whose strength appears boundless. Sadly, System Shock 2 failed to achieve great financial success, and in the wake of the closure of its development studio, the publishing rights came to be owned by Star Insurance Company, which essentially removed it from the marketplace. Used copies can go for up to $200 on Amazon.com and eBay, and most gamers resort to pirated copies that pop up on various sketchy Web sites. If your thrift or ethics preclude you from actually playing System Shock 2, consider checking out one or two of the narrated playthroughs on YouTube, which at least provide a taste of the title. I didn't read this entire post for the spoiler warning, but I did play the original System Shock back in high school. Definitely story-oriented and suspenseful! It was like playing a sci-fi novel. I only played a couple hours of the first game, but from my experience, I'd say SS2 is even moreso.